Today I'm sharing a card I CASE'd (Copy and Share Everything) using the Lots of Lavender stamp set from the Sale-a-Bration catalogue. I love this stamp set - besides being one of my favourite flowers, it is also so easy to use. It's a two step stamp set with the outline of the flowers as one stamp and then backgrounds as separate stamps. It's like being able to watercolour using a stamp set and you don't have to be perfect! 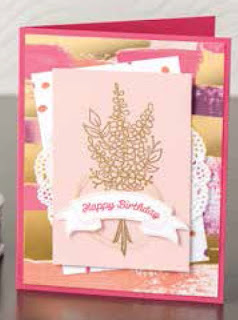 Here's the card I CASE'd from page 8 of the Sale-a-Bration catalogue. A few differences for sure, but I stayed true to the layout. Here's the supply list for the card. You can choose this stamp set for free during Sale-a-Bration when you place a $60 (CAD) order.